With a 98% success rate over ten years the InCeram system has proven itself one of the strongest and yet one of the most esthetic all-porcelain system on the market today. An InCeram crown is made of extremely dense-sintered aluminum oxide. The flexural strength was measured to be within the 350-700 Mpa range while maintaining the highest degree of translucency. The strength in the core material is such that an InCeram core can be used for prosthetic reconstruction anywhere in the mouth. 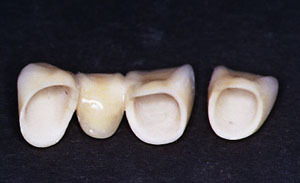 InCeram can be used to construct multi-unit bridges anywhere in the mouth. The material has excellent tissue biocompatibility and does not cause gingival irritation. With its high degree of translucency and color adaptation to the dentin, In-Ceram® offers the ideal combination of perfect natural esthetics and high strength. Yet it is opaque enough to block out discolored preparations or post and core build ups.